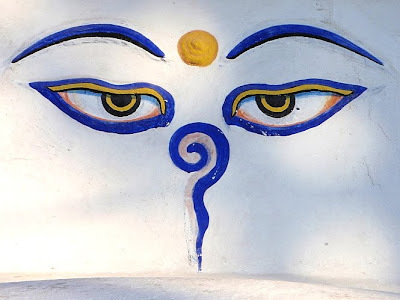 "Feb 26- Nagarkot. 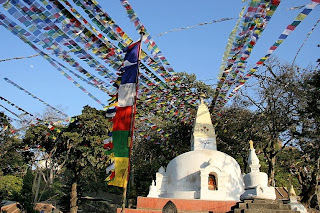 Situated at an elevation of 2175 meters, it provides a grandstand panoramic view of the Himalayas. You can see five of the worlds 10 tallest mountains — Everest 8848 m, Lhotse 8516 m, Makalu 8463 m and Manaslu 8163 m and many other lesser summits. 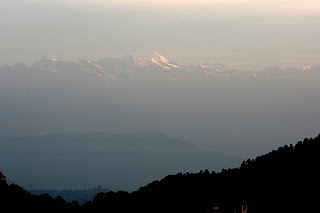 Nagarkot — Delhi - International Flight. Check out of the hotel and board the late morning flight to Delhi. 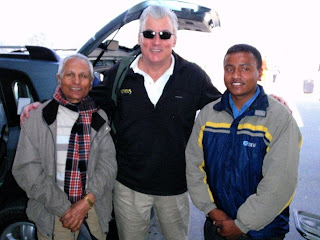 Arrive at Delhi and you are greeted at the airport by our travel facilitator and driver. You can use the remaining few hours you have to do some last minute sightseeing or shopping. We can make suggestions based on your interests. Your vehicle and driver stay with you until your (usually late evening) assisted check in at the airport. Our services end at Delhi airport." We had an early wake-up call to greet the dawn. 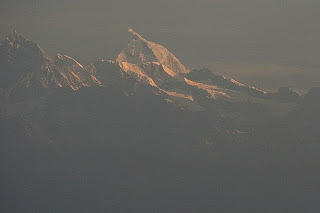 Admittedly, the dawn view of the Himalayas was spectacular. 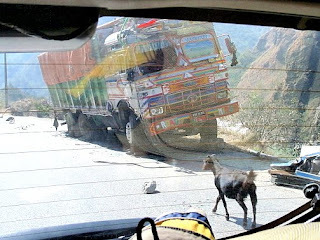 Was it worth adding eight hours of driving on one of the worlds most dangerous roads? I remain unconvinced. 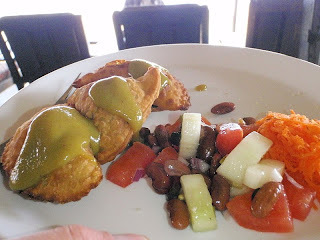 There were a few other problems with Hotel Club Himalaya. The food was good and the staff tried hard, but neither the internet nor the tv worked - probably having to do with the frequent power outages in Kathmandu. Shortly after the sunrise vista, we are packed and begin the long journey home. After another drive through the terraced fields and brick kiln smokestacks of Kathmandu valley, Surendra and Hari see us off at the airport. I can't say enough about these guys, or any of the guides and drivers on this tour. They were all top notch. We had a long a layover in Delhi - enough time to come full circle on this trip. We started with a shopping trip to the Kahn Market over three weeks before. 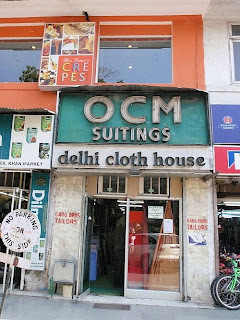 Sigrid wanted to go back to the Delhi Cloth House to pick up another pashmina or two. Mission accomplished, and we still had time to relax for a few hours in a day room before the final flights home. Since we could not get on the internet in the last 72 hours before leaving, there was no hope of an upgrade, and nothing to do but grin and bear it for the next 24 hours of travel time. The less said about it the better, but the trip home was not fun, and included a mad dash between terminals in Newark to barely make our connecting flight home to San Francisco. 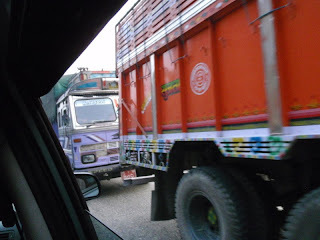 It was great trip while in India and Nepal, but getting there and back was brutal. We were glad to get home. 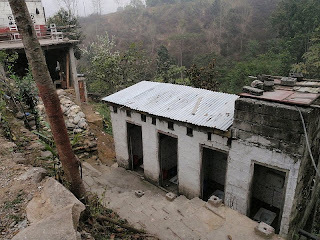 "Feb 25 - Chitwan - Nagarkot. 5:30 a.m.: Wake-up call followed by tea/coffee. 9:30 a.m.: Departure. Drive to Nagarkot. 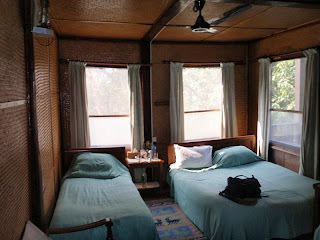 Arrive at Nagarkot and check in your hotel." 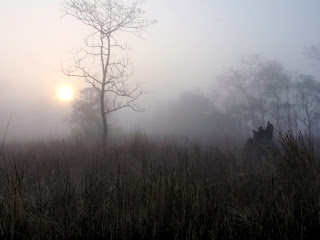 Late afternoon - You can choose to wander around the village or indulge in a short trek in the surrounding wilderness." 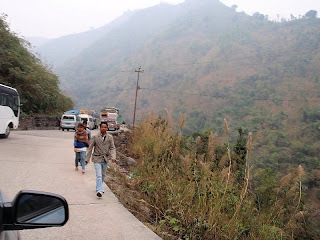 This day had the greatest variance from the expectations set in the itinerary and your loyal blogger's single biggest gripe about the trip. As I've said before, in general we were very happy with the itinerary, planning and service provided by Easy Tours of India during the trip. But this day was a big time miss. 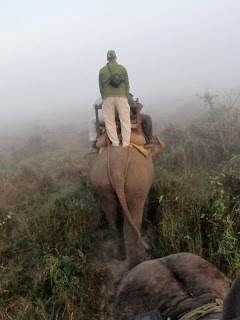 Our last Elephant Safari was a great start on the day, but the itinerary simply does not appreciate the nature of the drive to get back to Kathmandu, and Nagarkot is on the other side of Kathmandu. 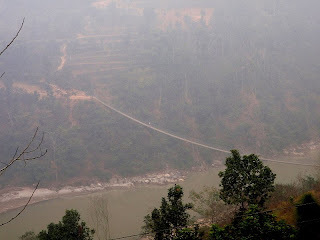 ...with the last two hours fighting traffic in rush hour through the smog choked streets of Kathmandu - before beginning the climb to Nagarkot. 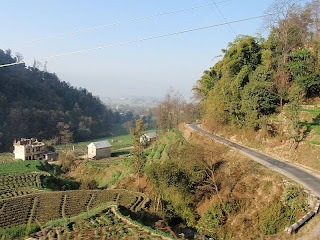 By the time we finally get to Nagarkot it is dark, and the itinerary suggestion to "wander around the village" or "indulge in a short wilderness trek" is fantasy. 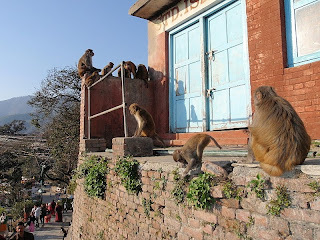 It just can't happen on the back end of this drive, even if our kidneys had held out and we had not stopped at the monkey temple. 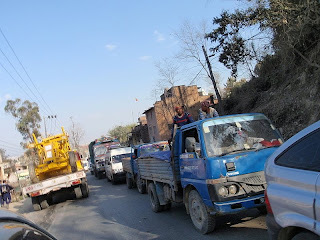 The first Kathmandu - Chitwan drive could be justified based on an opportunity to see Nepal from the road, and to avoid the unreliability of Nepal air travel. But making a long drive back even longer, arriving after dark, and knowing that we would be getting up to greet the dawn and then head immediately back down to the airport - all to get one early morning view of the Himalayas - struck me as batshit insane. Hey - it is a nice view - just not worth that drive. I took these using the Palm Prē during our last elephant back Safari on Thursday morning 25-Feb. We've got much more from our two days in the park, but thought I'd que these up in case I run across a friendly wi-fi hotspot during the long journey home. Most likely these pics will post when we are between flights in Newark. As expected, this was originally posted when the Palm Prē finally reconnected to the Sprint network during our brief layover in Newark on the 27th. I'm updating this post to correctly back date it in the blog on the date the pictures were taken, edit the title, correct typos, and add a few more pics from Sigrid's camera and mine. Home in San Francisco, you can get a traffic ticket for this. Actually this was pretty important. Our driver was getting updates on the whereabouts of the wild elephant. We learned he was on our tail shortly after leaving the lodge area. This prompted an increased pace until we crossed the stream, and he lost our scent. 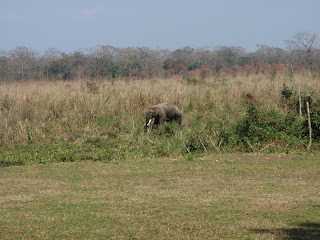 From the moment we arrived at Tiger Tops Lodge we were hearing about the wild elephant in the park. At first this struck me as odd. Why wouldn't there be wild elephants in the park? 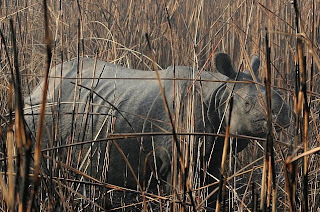 The reality is a rich diversity of extraordinary and rare wildlife exist in Chitwan National Park, but there are very few wild elephants. 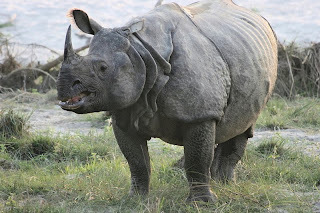 The park straddles the India border and is contiguous with a park in India where elephants are more prevalent. 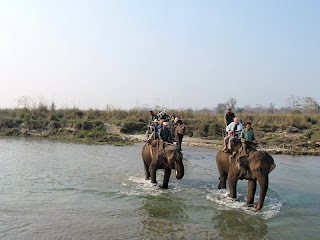 Occasionally a young male will wander across the border into Chitwan in search of new territory and female elephants. 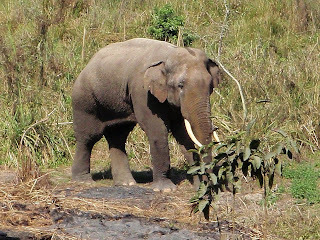 Tiger Tops is home to a stable of mostly female domesticated elephants which are employed as mounts for the "elephant safaris" into the park. The stable of domesticated females is an obvious attraction to a young bull. 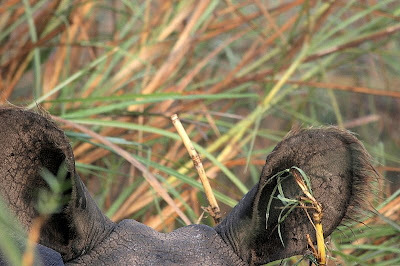 When young bull elephants are in musth, they can be unpredictable and, as described by the Tiger Top staff, downright"crazy". This is the case with the rogue currently wandering in the park. 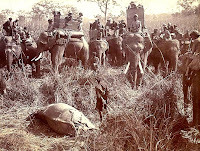 The elephant had killed one man and injured another only a few weeks before. 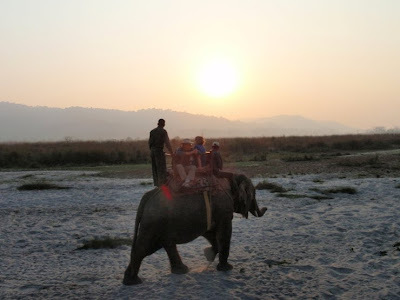 The staff was closely monitoring the location of the elephant at all times, and would divert or delay nature walks, elephant safari's and other guest activities based on the movement of the wild elephant. 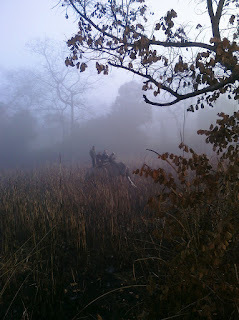 Shortly after the morning nature walk, the wild elephant made a dramatic appearance at Tiger Tops. I was heading to the main building for lunch, when Dhan got my attention. "The wild elephant is coming. He will walk by here." Most of the other guests were already sitting down to lunch. Sure enough, he came strolling along the two wire fence, making a bee-line for the elephant stable. 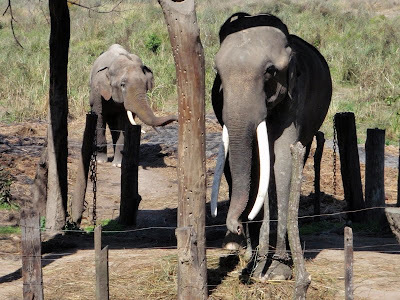 The only thing between the park, the wild elephant, and us, was a simple fence comprised of two small wires strung along six foot posts. As a physical restraint, it couldn't stop me from walking through it, let alone a full grown bull elephant. But it looks like the electrified fences farmers use to keep elephants out of their fields. It is not electrified, but it looks like it. Apparently this elephant had seen that kind of fence before, and was not inclined to test whether it was plugged in. As Dhan explained with a smile "We are lying to the elephant". Most of the staff started toward the stables to see what would happen. I decided this was more interesting than lunch and followed the staff. Dhan looked concerned and attached himself to me. "How fast can you run?" He asked. This was actually a serious question. Dhan was worried as he had seen me limping a bit during our nature hike earlier in the day (lingering effect of getting my knee scoped last summer). This was, after all, a killer elephant. Still - all I could think of was an old joke "I can't outrun the elephant, but I only need to outrun you." Dhan was not amused. While much of the staff gathered around the stables, I think I was the only guest, and shot the video clips compiled above. In the clips, the wild elephant arrives, and moons forlornly over the females from the other side of the fence. There is one domesticated male elephant living at the lodge, a big tusker that was born and raised in captivity. He was off working with some of the females hauling grass when the wild guy showed up. He returns in the middle of this clip. He has bigger tusks, and should be dominant, but it is not clear to me how they react to each other. The domesticated male appears to lose interest despite the efforts of the handlers to keep him focused on the interloper. CEO Marcus Cotton (with the binoculars), and Director of Operations Tim Edwards (standing next to him) watch the interaction. Eventually the wild elephant wanders off. I'm sure this is not the end of the story, but unless someone from Tiger Tops sends me an update, I'll never know how this eventually played out. My guess - I don't expect the wild elephant will be denied the object of his affection. But for this particular chapter in the pachyderm love story, it was all over in time for me to still enjoy lunch. 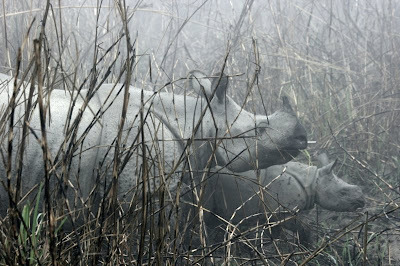 Feb 24 - Chitwan. 5:30 a.m.: Wake up call followed by tea/coffee. 9:30 a.m.: Crocodile walk. 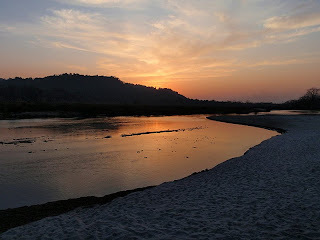 A 45 minutes walk through grassland and forest upstream of the Narayani River. After the walk you will board a boat to observe crocodiles along the banks while floating back to the camp. I've never let a limited grasp of the facts or a small base of actual experience get in the way of leaping to broad sweeping conclusions, and this won't be an exception. 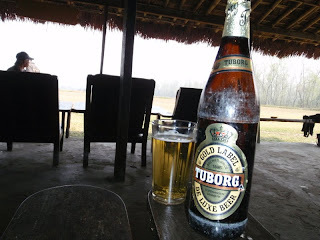 We spent two nights at Tiger Top Jungle Lodge, so I feel qualified to conclude: If you visit Nepal, the Royal Chitwan National Park is a must see destination, and the Tiger Top Jungle Lodge is the best way to experience it. 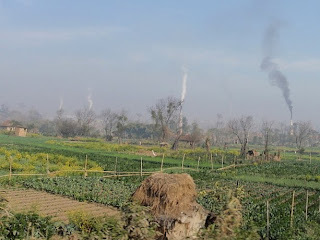 It is a well run operation that strives for eco-friendly operations. The umbrella Tiger Mountain organization has undergone a management shift since the death of founder and leader Jim Edwards last year. New CEO Marcus Cotton and Operations Director Tim Edwards (son of the founder) were on-site during our visit. Both were very friendly and interactive with guests. We learned the lodge had a rough spot last year, with a precipitous drop in American tourists. I'm not sure whether this was attributed to the financial crisis, the Mumbai massacre or both but we were very happy we made it part of our tour. 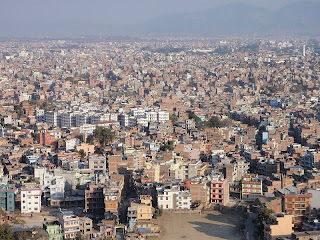 Our countrymen need to get a book on rudimentary statistics, stop worrying about terrorist threats that are less probable than getting killed crossing any urban street, and visit this Nepalese treasure. 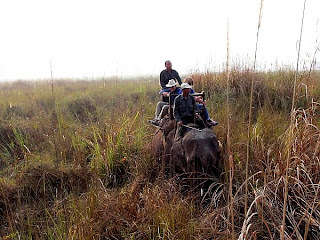 Located within the park, the main attraction of the Tiger Top lodge for us are the Elephant Safari's - forays into the park riding the back of an elephant. 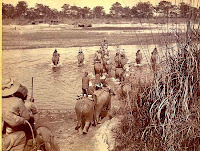 The elephant safari was one of many options afforded to explore the wildlife - including jeeps, canoes, boat rides and hikes. I arrived thinking the elephant safari might turn out to be a gimmick. Our first excursion disabused me of that notion. 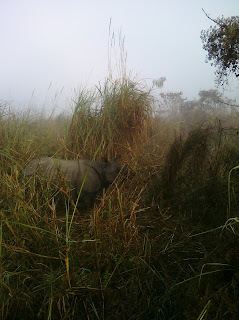 We had so many great rhino sightings that it was easy to forget just how rare these animals are in the wild. 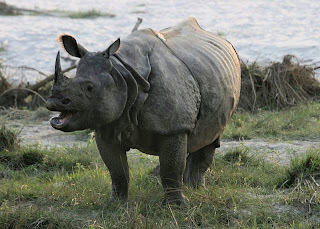 They are even more endangered than the tigers. We almost became complacent about it. Almost. But not really. 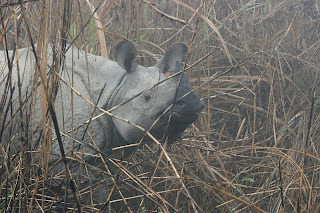 "Feb 23 - Kathmandu - Chitwan. 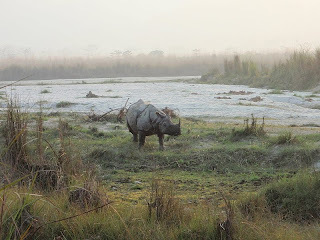 Check out from your hotel after breakfast and proceed on the drive to Royal Chitwan National Park. 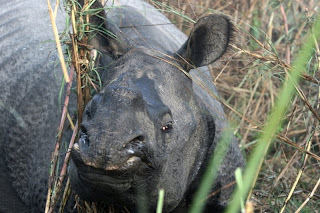 Royal Chitwan National Park is one of the best managed and preserved in Asia and is home to many species of rare wildlife, including the rare one horned rhino, the Bengal tiger, up to four species of deer, sloth bear, leopard, and many more. More than 400 species of birds can be seen in the Park, including many that are only found here. 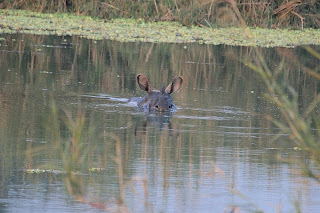 During the two nights stay here we undertake jungle safaris, elephant rides, nature walks, canoe rides etc. 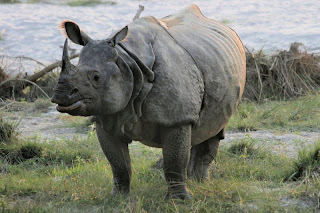 You are invited to witness the local Tharu stick dance on at least one of the evenings. 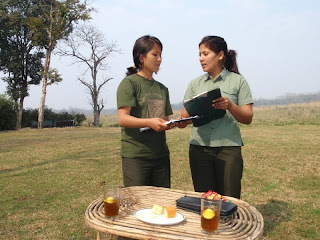 On reaching the resort, our guest relations officer will brief you on the Park and available activities. 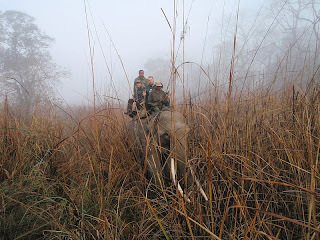 3:30 p.m.: Elephant Safari / Jungle Walk/ Nature walk with Boat ride. 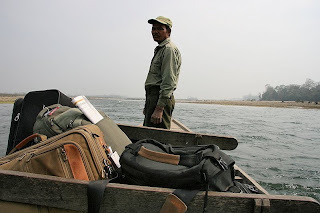 Up early, we repack and reorganize the luggage (again), check out of the Dwarikas Hotel then hit the road to the Tiger Tops Jungle Lodge in Royal Chitwan National Park. It is a six hour drive over a mountain pass so we settle in for long haul. Nothing like a road trip to better acquaint us with our driver and guide. 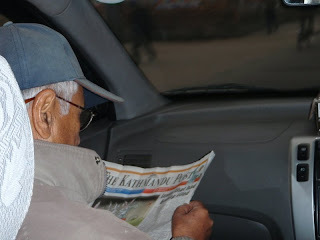 Surendra and I review the morning Kathmandu Post, and discuss Nepalese politics. Surendra is an interesting guy. Born in Kathmandu, he has lived in Nepal his entire life and speaks English with a precise British accent. 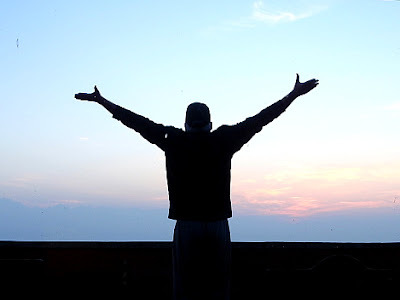 As a boy he remembers his father bringing him to a raucous celebration for climber/sherpa Tenzing Norgay after his successful climb of Everest with Sir Edmond Hillary. After our exposure to the demonstrations and strikes, I am increasingly intrigued by Nepal politics. Surendra provides an introductory tutorial during the drive as we discuss an article on China relations in the morning paper. There are many factions fighting for power, and an imminent trigger for change . A new Constitution is yet to be written, but is mandated to be implemented in the next 100 days. It does not sound like a good mix to me. Perhaps we will help them get it right. Perhaps not. We climb out of the fog and smog of the Kathmandu valley. I think we are experiencing an inversion layer that rivals the worst of LA smog days. 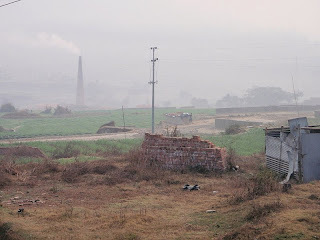 Belching brick kiln smokestacks and massive truck traffic spewing diesel exhaust is trapped in the air we are breathing. Sigrid has developed a cough, and the dust and bad air is wreaking havoc on my sinuses. The air gets better as the road climbs higher. This is a dangerous road. Undivided, narrow, and pockmarked with potholes, a lot of traffic compete for the limited roadspace. Everything from trucks, cars, scooters, motorcycles, bicycles, rickshaws, camels, pedestrians, and ox drawn carts weave through and around each other as the road winds up and down the mountains. The left "shoulder" is an abrupt 2-3 foot drop from the roadbed to ditch. A wheel drifiting six inches off the road could easily roll a van or truck. The right shoulder was a 100 foot drop to the river bed below. Occasionally with concrete or rock protecting travelers against the edge, more often - not. 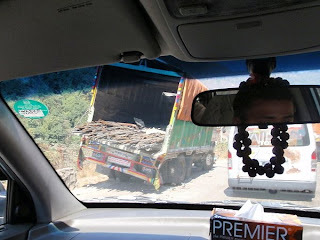 Over the six hour drive we saw two trucks inverted on the left shoulder, and as we approached the crest of a hill, saw people peering at the wreckage of a vehicle over the side on the right where it had plunged off the cliff moments before. Okay... I was a bit nervous on this drive. 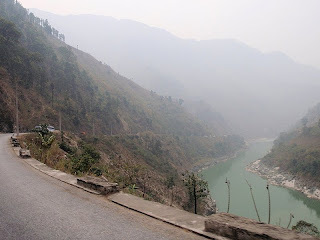 But Hari is a careful driver, and there were great vistas and interesting things to see along the way. We take a rest break, enjoy the views, drink some chai, and use the facilities. Yeah, we're not in Kansas anymore, but we already knew that. 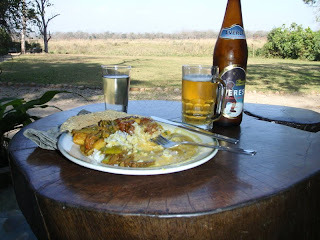 We are met at the Tiger Top Jungle Lodge landing strip, have lunch and a beer, and are transported to the lodge. We were glad to be here. Next time, we'll fly in. We join our luggage fording a river. 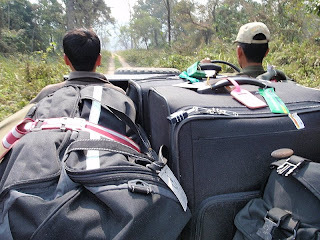 We join our luggage on a jungle drive. ...and makes it to our room. ...and we are real glad to be here. More critters in the next post.